Posts tagged "colors from rocks"
My son found a rock alongside the driveway, near the creek. He kept it to give me since he knows I’ve been smashing a lot of rocks lately. This one seemed like it would be a great rock to make some of my earth pigments and handmade watercolors. 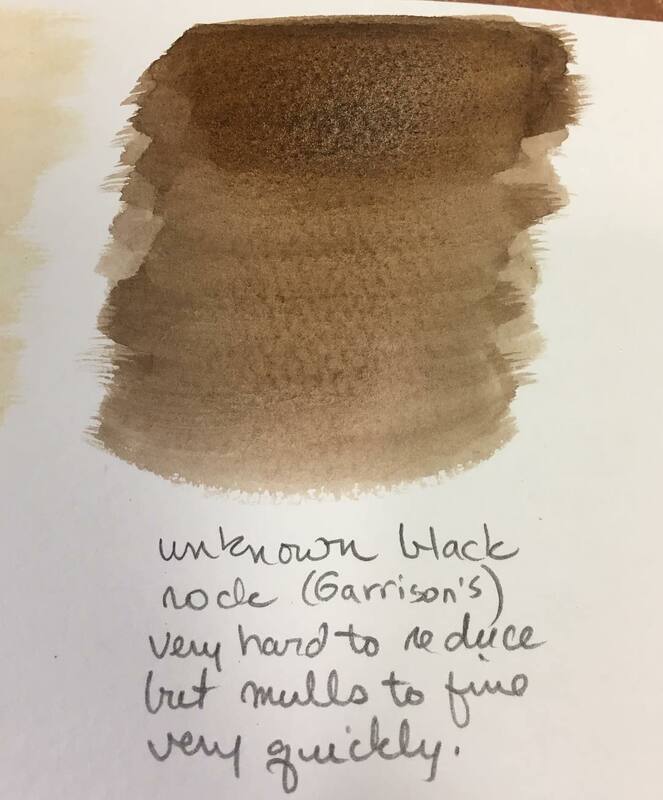 It was mostly black, with some brown. I thought so too. It appeared to be black sandstone – and I need another source of black. With some sense of excitement, I took out my hammer and pounding board (otherwise known as a chopping block to those who actually cut up things to cook). That rock surprised me. It surprised me in a couple of ways. First, it wouldn’t break. I mean I pounded that rock so hard it broke the board beneath it. So I took it outside. Finally I did manage to break off a small sliver. Considering how much effort it took to break even the tiniest piece of it off, doubts about making paint from it had begun to cloud my happy day. Before I set to reducing the sliver to dust, I looked at it under the magnifying loop. Lots of little pockets of shiny, glassy, black were there. It looked like obsidian or glass. So I took some pictures of the rock and tested it to see if a magnet would attract to it. Nope. One of the state geologists said it may be ‘carbonated sandstone’, which is typically very hard. Just a really hard rock with interesting black glassy bits. Not to be deterred so easily, I put the sliver into my handy stainless steel mortar and used the hammer on the pestle to crack it some more. It didn’t surprise me that it was hard to grind to a powder. In fact, I was only able to reduce a small portion of it to actual powder. The rest was far too grainy to use for paint. But I took the powder I did get and made the little pile on my mulling board and put the media in it. And that’s where the second surprise happened. That powder, which still felt very gritty to my fingers, mulled down to the smoothest paint ever. And not only that, it made the brownest brown I’ve found yet. This part really excited me. But not enough to make me try to grind any more of it. My wrists were sore from the first attempt. I kept the rock and will see if I can make more brown later from it. This is one color I doubt I’ll ever sell, just because for one, I’m not sure where to get another rock like that. And two, because it’s just far too hard to grind. However, the brown compliments my own personal set of paints quite nicely and I’ve used it in the pelican I’m painting now. It was the best color for the job and I’m glad I had it on hand. It probably gets the color from manganese. Thanks, Garrison! Pick up any other rocks you might think I’ll like in in the future. I think I’ll call this one “Hard Rock Brown”.